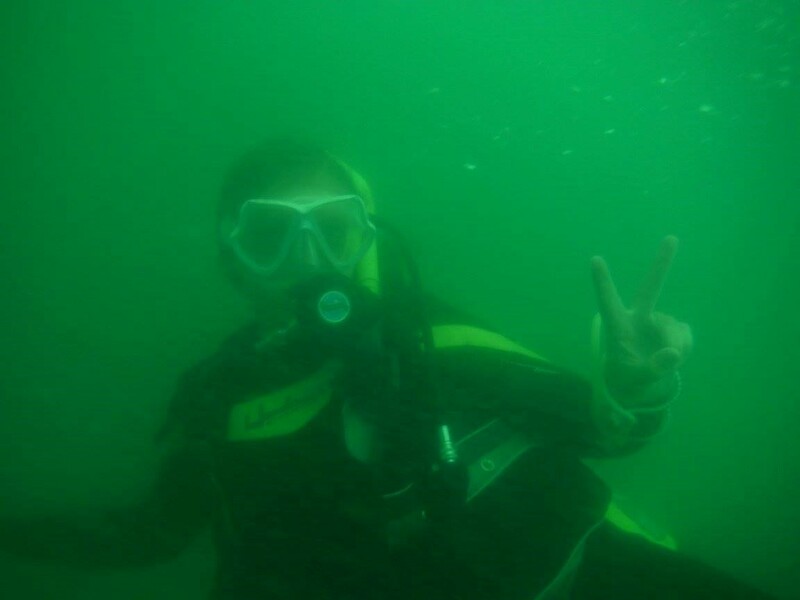 Science job perk #4182: scuba diving at work. 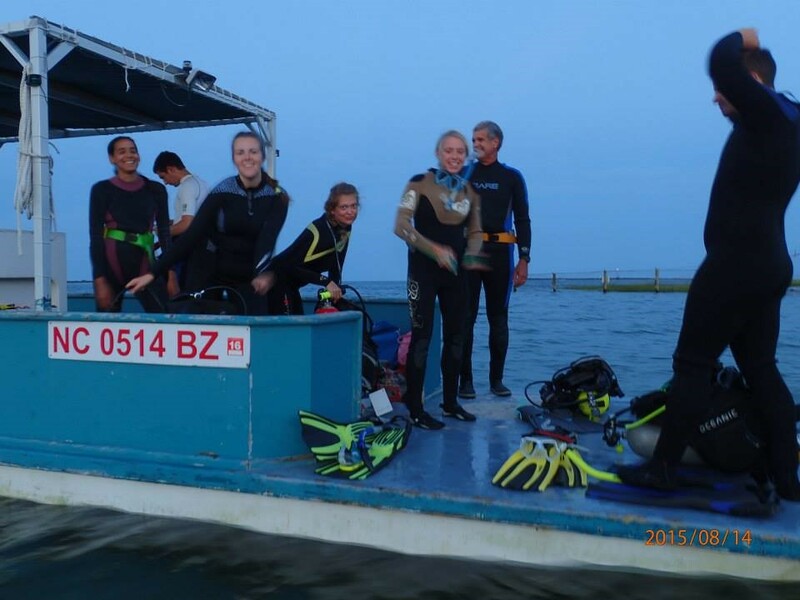 In today’s adventure, guest blogger Larisa Bennett takes the plunge into scientific diving at the UNC Institute of Marine Sciences. 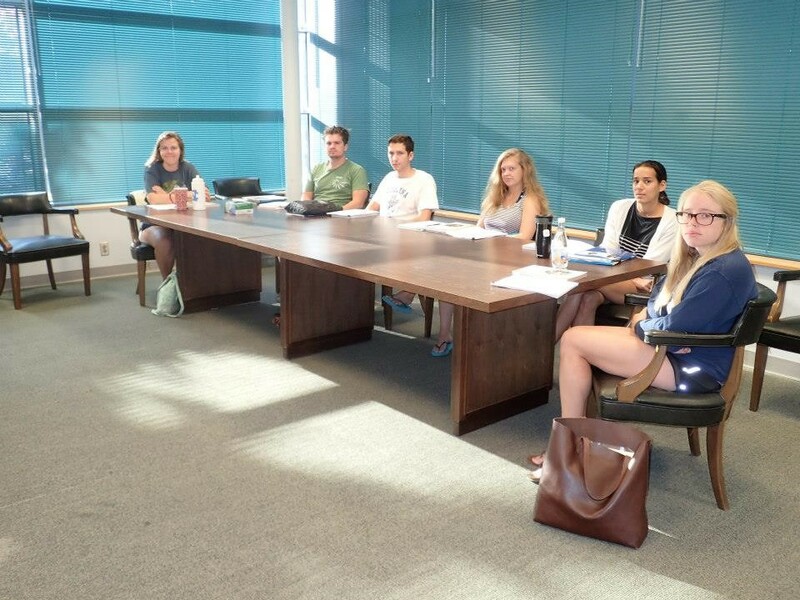 Read more about her semester with the Institute for the Environment’s Field Site program in her first two posts! We sleepily loaded our gear onto the R/V Capricorn and headed east into the dawn light over the still dark sea. Once at the dive site, sky and sea now illuminated by a bright beautiful day, excitement took over. My sleepiness was forgotten as I prepared to jump into the big blue depths. Under the waves it was a blank blue expanse as far as the eye could see other than the bubbles rising from my regulator. As I descended, the Indra appeared beneath me wraithlike out of the void. The wreck sat in all its majesty with corals, sponges, and other organisms growing on it. Fish of all shapes and sizes swam around the twisting metal. The amount of fish was staggering. Trying to count them all for a fish survey was next to impossible. Swirls of colorful life drew your eye every way you looked. Sometimes it was hard to remember the species in the sensory overload. There were many fish I had never seen before. They all hovered around the wreck seeming perfectly at home there. Myriads of fish darted in and out of the corals feeding on phytoplankton and zooplankton floating in the water. Size ranged from fish as tiny as a blenny to the large black sea bass. Conditions on the site were ideal, there was only a gentle current so it was easy to float above the wreck and observe the life it held. The translucent blue water did not require a dive light to see through. A slight haze gave the whole area a dreamlike aura. Only this dreamscape was real! Some of us grew up watching Jacques Cousteau on PBS and fantasized sailing onboard the Calypso to discover the great blue deeps of the tantalizingly mysterious ocean world. 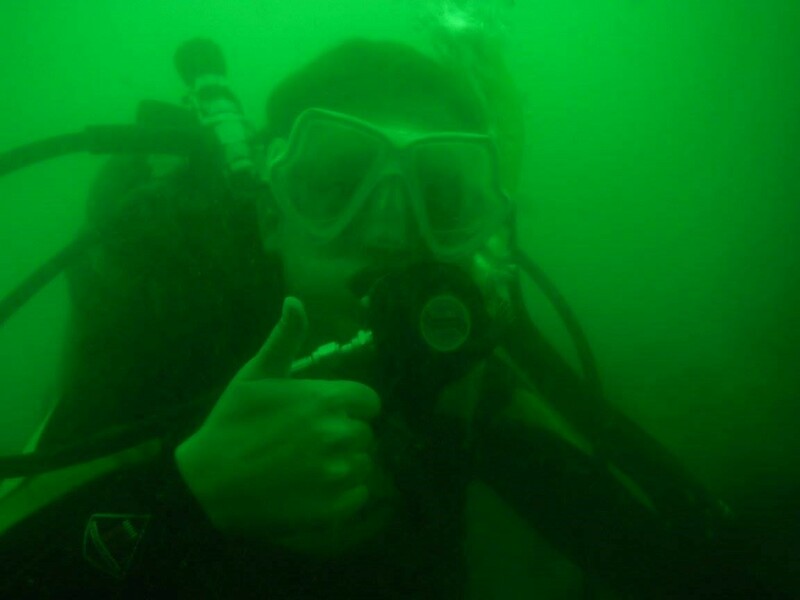 When we got older, we dreamed of being a real scuba diving scientist with our own research laboratory at Woods Hole, Costa Rica, or Morehead City. Well, good news! 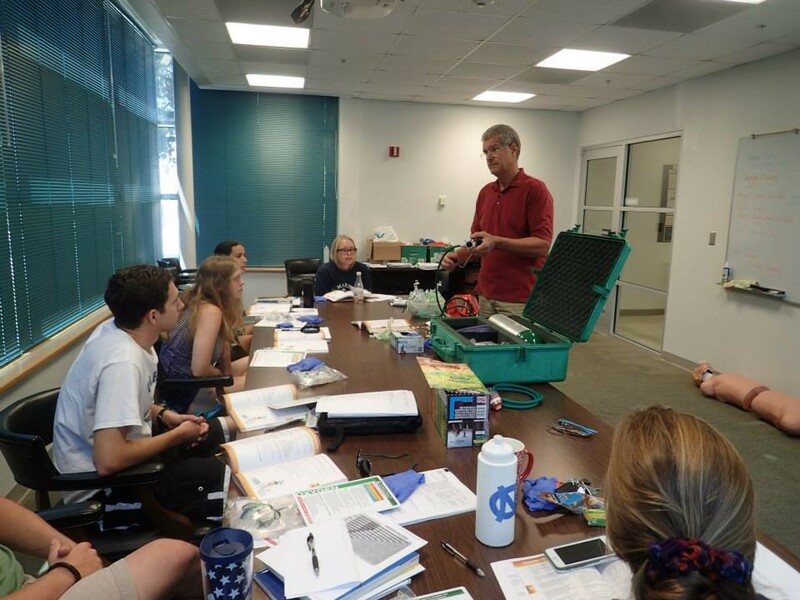 The UNC Institute of Marine Sciences (IMS) offers a scuba class to learn the skills needed to become a certified science diver. 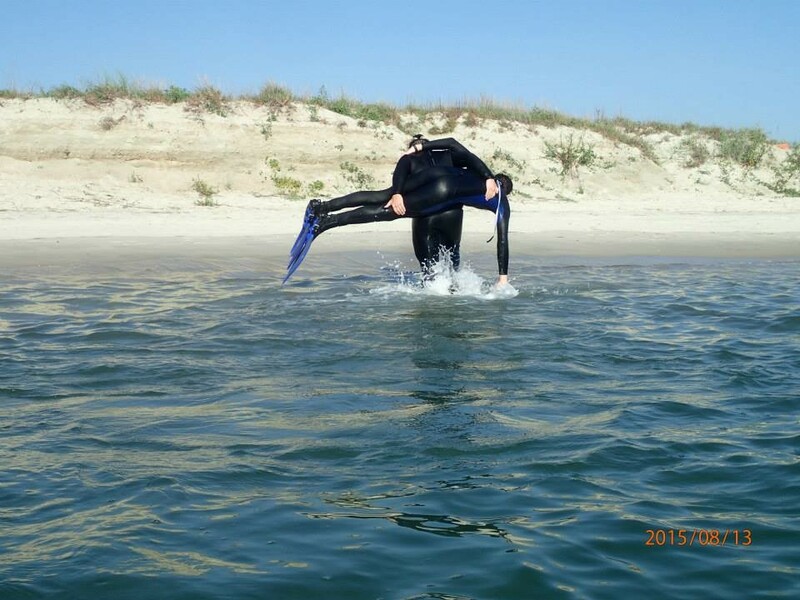 I took the “Scientific Diving and Underwater Experimental Design” course this summer offered at the Institute of the Environment Morehead City Field Site location. 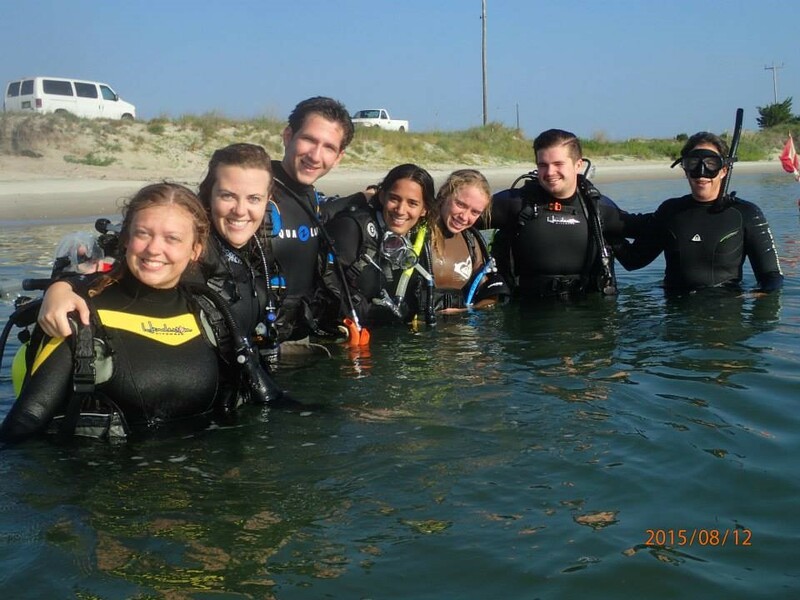 The two-week class is open to undergraduates attending the fall field site semester at Morehead City as well as to graduate students from any university. 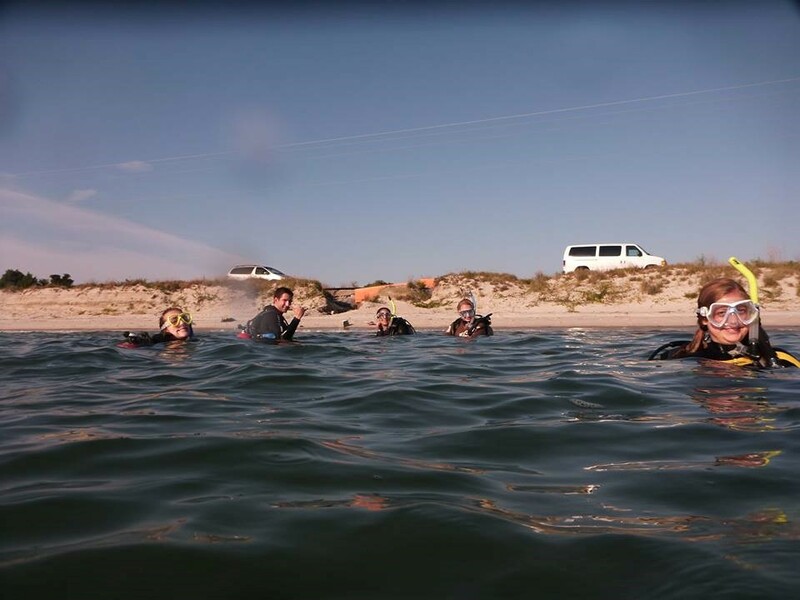 Participants gain the American Academy of Underwater Scientists (AAUS) certifications required for diving with agencies that conduct underwater research. They learn to handle crisis situations while diving and practice skills that facilitate underwater scientific field work. Divers gain the official credentials to dive deeper and longer than allowed with basic Open Water certification. The class first focused on learning rescue skills in preparation for possible underwater emergencies ranging from how to treat the basic urchin spine embedded in the hand (a technique I already have had to use on myself) to more serious injuries such as a bite sustained from the highly toxic blue ring octopus. We learned other medical rescue techniques such as how to conduct neurological exams, perform CPR, use an Automated External Defibrillator (AED), tow divers to shore whilst giving rescue breaths, and administer emergency oxygen to a distressed diver – a common treatment in diving emergency situations. After completing rescue training, the real fun began. We dove in different situations and water environments while performing scientific experiments. 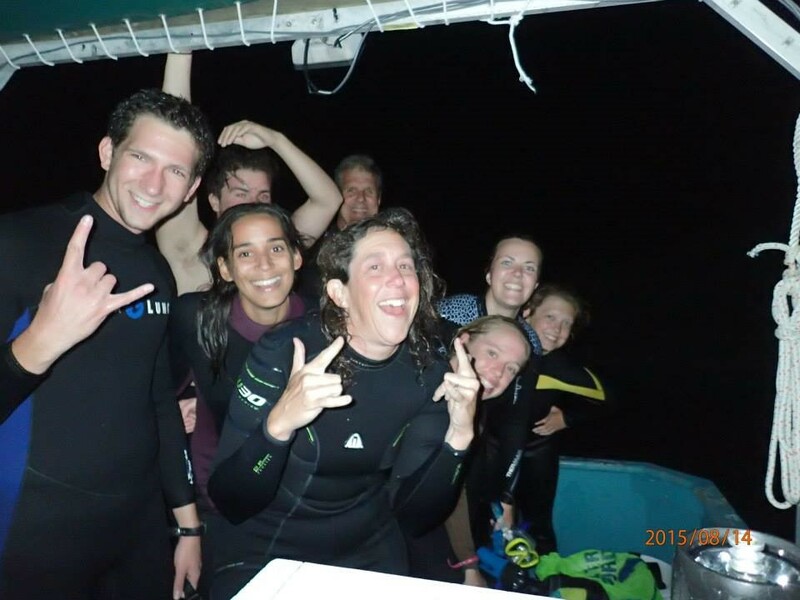 This included night diving, drift diving in a current, an underwater navigation dive perfecting our use of compasses, a deep dive on a wreck, and several dives toting quadrats, transects, underwater cameras, arm slates, and other equipment needed to perform underwater scientific research. 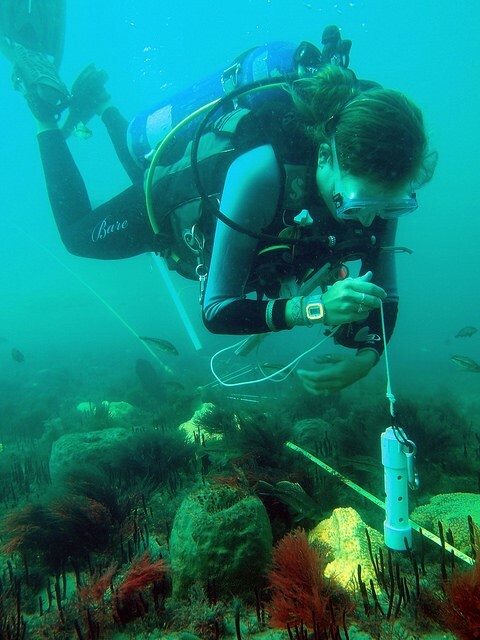 We practiced measuring percent cover of algae species using quadrats we constructed ourselves, performing fish surveys along transect lines, and producing photo quadrats with large underwater cameras that seriously tested our ability to maintain neutral buoyancy. 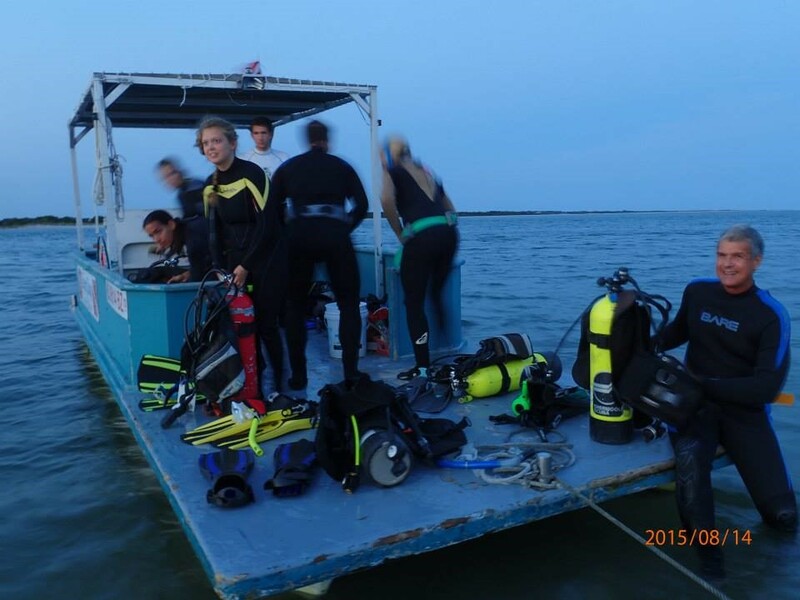 We gained practical experience planning dives, producing dive emergency action plans, and preparing first aid and oxygen kits. The class culminated in a final excursion to the Indra wreck putting our new skills to use while collecting real data with two lab technicians from IMS. We dove using Nitrox – an air mixture of nitrogen enriched with a higher concentration of oxygen in the gas compound to extend bottom time – at the moderately deep depth of 70 feet where the Indra rests on the seabed. The USS Indra was sunk to its current location about 10 miles out from Beaufort Inlet as part of the North Carolina artificial reef project. Holes were cut into the sides of the hull before it was scuttled. 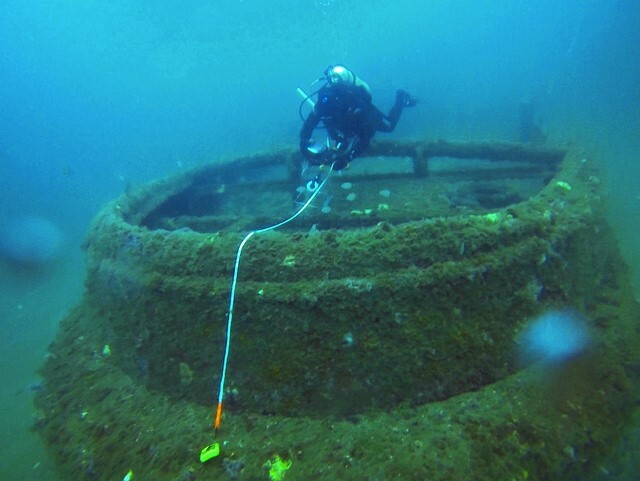 Divers can use these and get a good view of the diverse marine life that congregates around and within the submerged vessel. 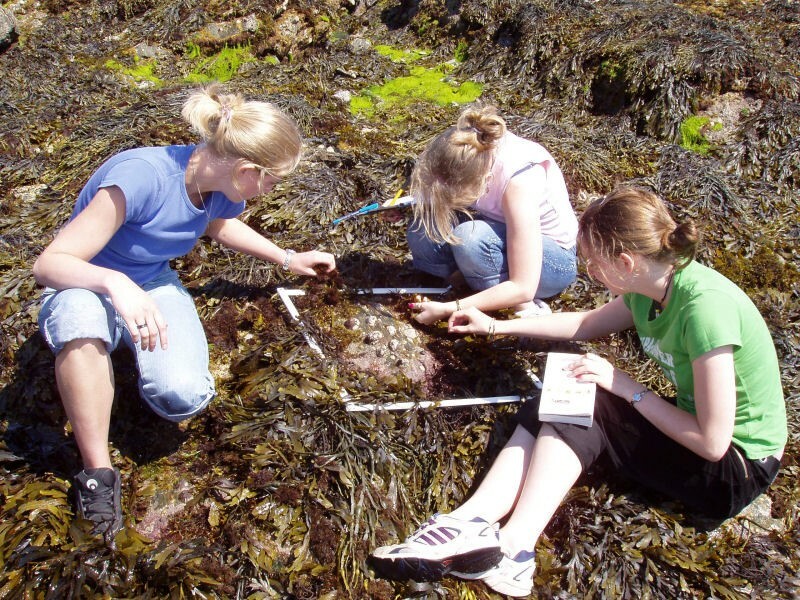 Because the site is so rich with aquatic life it is a perfect place for underwater research. We collected data using fish surveys, photo quadrats, and rugosity measurements taken along transect lines. 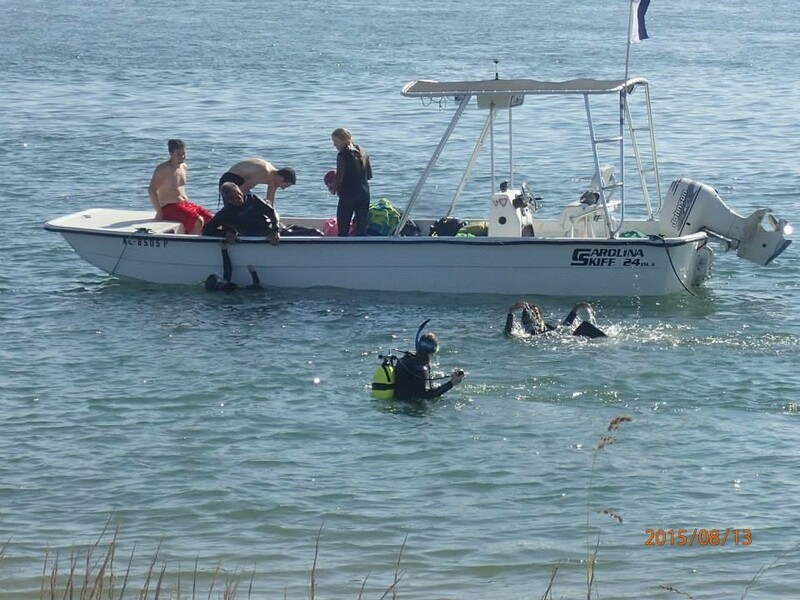 We were a total of ten divers split into two teams of five. Each team had two divers conducting the fish survey, one diver controlling the camera to take photos, one diver to take the rugosity measurements, and one diver to float above the team as a lookout. The fish survey is a log of the types of fish observed, how many of each and their position in the water column. This can be a challenging exercise given the sheer volume of wildlife surrounding the wreck. 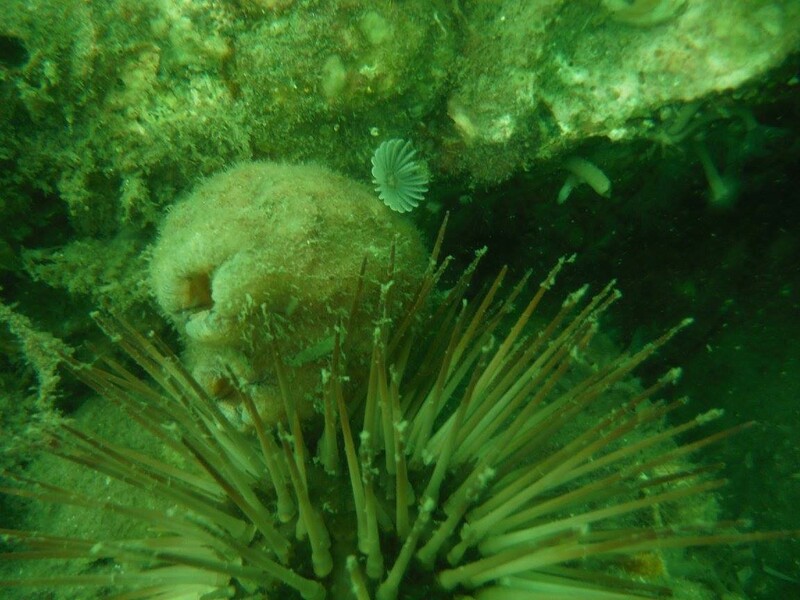 Photos were taken every few meters on a transect line for later analysis to identify what was growing on the wreck. Rugosity calculations measure variations in the surface height of the seafloor and are obtained with a special instrument held over the bottom as you swim along a transect. 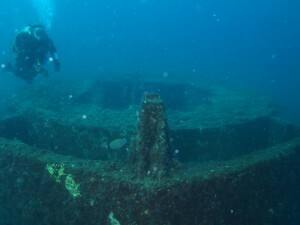 Fish surveys and photos are useful to determine what species are present at artificial reefs such as the Indra and how the various organisms are using the sites. Reefs provide feeding, breeding, nursery, and living habitat for various marine species. The statistics we collected on our dive at the Indra are being used in a PhD candidate’s doctoral thesis. Our amazing dive experience into the great blue deep that holds the Indra was a scientific success as we obtained good data for the IMS researchers’ use. Collection of real data in an actual experimental setting completed our training as science divers ready to go out and discover the mysteries under the sea. Okay Calypso explorers, move it on over! Tags: AAUS, Fish, Guest Post, MHC Field Site series, research, scientific diving, Scuba diving, UNC IMS. Bookmark the permalink.